"The Deck of Cards Story - You Might Want to Read This"
Over the centuries that have gone by, there have been millions, if not billions, of players of various card games. Although luck is less of a concern in games such as rummy, which are skill-based, it is difficult to completely negate its contribution. Rummy Online game is one of the best ways you can pass your time by honing your analytical abilities. The game, through the various strategies you are required to know and apply, enhances your cognitive perception. Not only this, your organizational skills are bettered as a result of constantly building sequences and sets in an orderly manner. In addition to all of this, even playing online rummy for free will give you the benefit of improving your time management skills. Tracing back your steps, you will realise that it is a deck of cards online that brought about such a positive transformation within you. Few players give the deck of cards, on its own, any thought. But there is an entire science behind how a deck of cards has been structured and the values assigned to every card is not a mere coincidence. The precision of calculation and the subtle meaning of every card might come as new knowledge to some but there are legends that exist from ancient times about the deck of cards’ meaning and origins. So, brace yourself for what you are about to read because, after this, a deck of cards will mean much more to you than it already does. Some of you might already know that a deck of cards is actually one of the most sophisticated forms of the Calendar Year. To know more about the calculation behind it, keep reading. There are 52 weeks in each year, which come as 52 cards in a deck. The 4 seasons of the year are represented by 4 suits in a deck of cards. There are 13 lunar cycles/weeks per season, same as 13 cards in every suit. There are a total of 12 months in a year, just as there are 12 court cards in a deck. Isn’t that amazing? Apart from this, on adding the face value of every card in a deck of cards (where Ace is 1, Jacks are 11 each, Queens are 12 each and Kings are 13 each), you will arrive at 364. When you add the first Joker with a value of 1, you will get 365 which are the days of a regular year. When you add the second Joker with the value 1, the number equals 366 which are the days of a leap year. Going a bit deeper, the two primary colours of a deck of cards are red and black. These two come together in the deck of cards, representing day and night respectively. Spades for Employment – The aspect of earning one’s living and being a productive contribution to society. Hearts for Love – The companionship facet of having a significant other on the journey of life. Clubs for Growth – This is the aspect of being rewarded for one’s efforts and the fruition of labour. Diamonds for Wealth – The prosperity aspect of life where one has more than what one needs to fulfil their desires. If you know more interesting interpretations of the deck of cards, then be sure to share it with us on RummyCulture. Also, join our vibrant community of players worldwide to get amazing bonuses and win money daily. 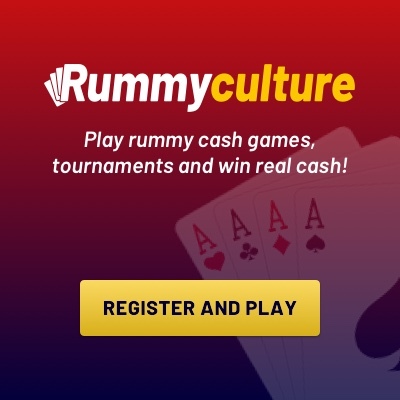 Download our app rummy today and start gaming on-the-go!